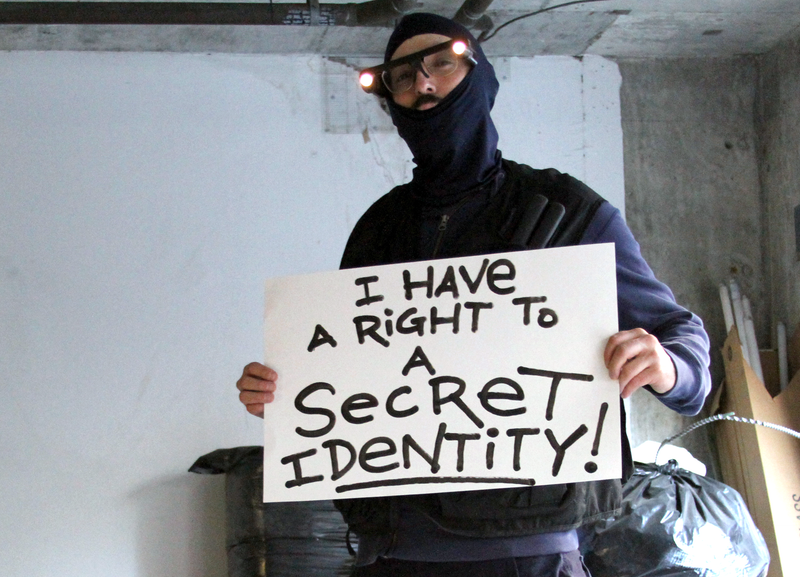 Join the Electronic Frontier Foundation, io9, and a coalition of fan groups over Labor Day weekend for Project Secret Identity, a cosplay photo campaign to raise awareness of how online anonymity and privacy are key to free expression. Visit ProjectSecretIdentity.org during Dragon Con (Aug. 29 – Sept. 1) to participate. For the first time in my life, I'm donning a costume at a convention. At Dragon Con this weekend, I'll put on a balaclava, a utility vest and a pair of flashlight glasses, shave my beard into a mustache and draw a mole on my cheek. For a few days I'll become Robert De Niro's character, Archibald "Harry" Tuttle, in Terry Gilliam's classic dystopian dark comedy, Brazil. First: Brazil has had a lasting impact on my life since I first saw it on VHS as a teenager. It put me on a track that has found me defending civil liberties at the Electronic Frontier Foundation. The film is one of the early imaginings of a society where an authoritarian government uses big data to manage and control a population. The plot revolves around a simple clerical error, which results in government agents kidnapping, torturing, and eventually killing the wrong guy—Harry Buttle, who they've confused with Harry Tuttle. Now, Harry Tuttle is a renegade heating engineer who's been branded a terrorist for making unauthorized repairs. He's a handyman superhero who hates paperwork and throughout the film, he keeps dropping his catchphrase: "We're all in it together." That brings me to reason #2. When it comes to mass surveillance, we are all indeed in it together, both as data points in the giant databases and as allies in the battle against them. That's why I'd like to invite you to participate in Project Secret Identity, a cosplay activism campaign by EFF, io9, and a cross-fandom coalition, including Harry Potter Alliance, Southeastern Browncoats, the Baker Street Babes, Wattpad and the Organization for Transformative Works..
We're asking you to put on your mask and pose for photo holding a sign that says "I Have a Right to a Secret Identity" or another fandom-specific message about the importance of Internet freedom. You don't have to be at Dragon Con to participate: Just upload your image at ProjectSecretIdentity.org and share it online. But if you are attending Dragon Con, you can get your photo taken at either our table (second floor in the Hilton Atlanta) or the Southeastern Browncoats' booth (#1000 in AmericasMart). As for the third reason I'm cosplaying as Harry Tuttle: Terry Gilliam himself will be at Dragon Con. If we're all in it together, surely that includes a selfie with me.